3 things to consider before living independently. Filipino culture has that close-family ties, and moving out from your parents' house is a no-no especially if you are a fave child. However, as adult, i think at some point in your life, you should try living alone. 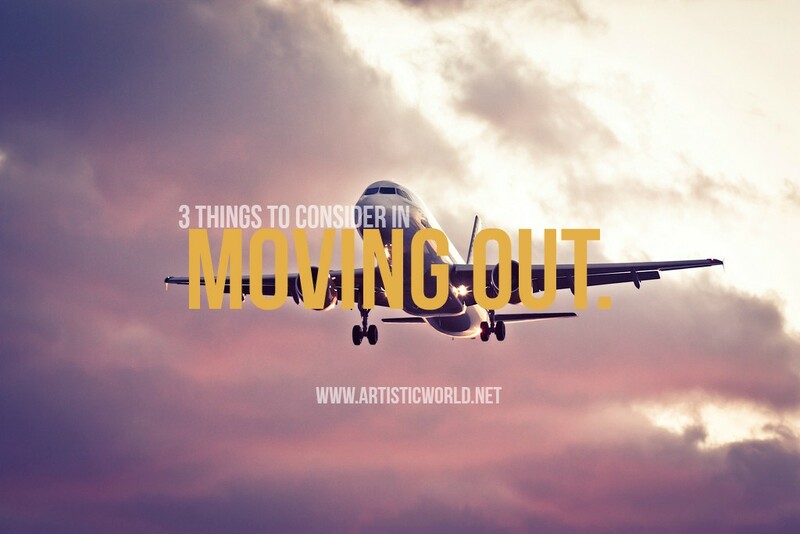 There are different factors that forces us to move out from a place. So, whatever your reason in moving out from your current place, these are the 3 things you should check before living alone especially if you are a newbie for this lifestyle. 1. Emotional status - If you have a close relationship with your family or home town friends, this is one of the things that you should consider. Living somewhere else, even if you visit your home town sometime on weekends, would still kill you emotionally. Living alone is also like going to another country, with new people, place culture and environment. If you live in a dorm, apartment or share a studio type apartment with friends, you would still miss your family and friends back there. By living alone with strange people, you would appreciate every single moments that you live with them, those times that you shouted at them or laughed hard with them would make you realize things. There's nothing really like a family bond or home town-overnight hangout friendly stuffs, so if you consider moving somewhere far, be ready for emotional separation anxiety in the beginning, we call it #sepanks. 2. Financial - This is one of the serious challenge for grown-up folks---finances. You no longer live with your parents right? You're independent, by that, you are responsible for yourself, my friends, that includes your finances. From a personal experience, i live alone to save money due to the cost that i incur for monthly expenses in travelling versus living somewhere near in my workplace. Finances also means responsibility in budgeting for your daily allowance, food, transportation, basic needs and sometimes a little reward for yourself. My advice is save (1), do not spend beyond your means (2) and be practical and identify your needs vs, wants (3). So whatever it is that you do to your money, always be responsible, never let other people save you from your money and debt problems, if you can't simply manage your finances, well, better check if you can really live independently. 3. Maturity - Yes, you should be! Maturity is in relation with those two points, emotions and finance with of course accountability and responsibility. Living alone means you are responsible for everything that happens to you and your routine. You maybe prepared emotionally or you have money to spend, but remember, managing your finances is maturity when you are spending it wisely. Be responsible because you have moved out and you are living independently, you therefore should be a grown up about the way you act and speak in your community. You should also be responsible for your laundry, your place (clean it atleast for God's sake), your waste, everything that happens around your apartment, your workplace , your health (consider running and exercising), and your society. Just simply be pro-active, that's the sense of being a matured grown-up man and woman. Truly, living alone might cut you at the beginning because there's a lot of adjustments when it comes to your "new" stuffs. However, living alone would teach you a lot of life lessons. You live alone now and independent, means that you are ready for the world. You would realize that life is full of responsibility, sacrifices (imagine how your parents sacrifice on their younger days right? ), curiosity, challenges, fun and possibilities, try not to stumble on things, try to fight, be pro-active and most of all, seize every opportunity as you face the world as a grown-up person. Not all grown-ups are grown-up, show to the world that you are really ready for it! Lots to consider in the move. You make some great points. Living alone, shifting out from parent's safe haven, this we all have to do sooner or later. And you have given good and sound advice to those who are thinking of leaving home. Have a wonderful Sunday! Good article on food for thoughts before moving out from your childhood home. Living alone can be rather lonely so sometimes older children only move out of their parents' house when they themselves want to get married. Same culture here in the Philippines MUN! Mahirap nga talaga to move out pag ganyan ang situation. Msya pa rin tlga kapag family ang kasam milton. We're quite attached to our nuclear family... Maturity wise .. I guess we need to do it to grow. but usually in other countries.. they do it all the time starting with college right?? Btw thanks a bunch for the nomination.. Really Cool of you.. In any case, maybe you could help me.. I would like to know about your views on the Food industry in the Metro... my friends and I have this little award thingy and has a survey.. I hope you don't find filling it up.. I mean, it's multiple choice.. and you also get heard.. Here's the link man.. thanks a bunch..
p.s. if you're up for it.. there;s a little giveaway... thingy at the bottom.. just in case you wanted to join.. LOL! True, but i think the essence of moving out is to really learn about life. sa case ko naman, 1st year hs pa lang wala na ako sa bahay. Nakatira ako sa ibang tao, kaya halos ok lang sa akin ang malayo sa pamilya. In time Lou, minsan lang kasi tlagang necessary to move out, but i would still recommend to live with family. You make some really good points here! All true! Living alone shouldn't be taken lightly because a lot of responsibilities are involved. Yes, I would agree on all three counts. Always good to know also that there will a home to go back to if things do not work out. Hi! Very interesting post. Thanks for sharing. This is very interesting. And I will change of country in a few years so I must be prepared for it. That's really a big deal right there sandra! Oh gosh. I've been thinking a lot about moving out but then, financially, I'm trying to make wiser decisions. While there are cheap rooms I can rent, I'd really rather own a condo/house. Sayang pera pag rent! So I wait until my income can sustain at least a rent-to-own place. That's the best choice dani! Im also considering buying my own place for a lifetime, so, we should all have the PAG IBIG loan then! Difficult in the beginning but there will always be ways to cheer oneself. A much needed rest with family members can become very exciting after a long separation. Independence can be deeply appreciated as one becomes successful in life. And knowing that we are stronger with our decision to be away but with a goal, deserves a pat on the back. When I did move out, it wasn't because I wanted to, it was because I had no choice. I see now that you are correct. We need all of these things to be ready to be out on our own. From your experience there mich! thanks for the insights! I didn't live independently when i was still single because it was more practical for me to live in my parents house. I live independently now with my wife. One of the best things I've ever done in my life. Aw, nice to hear that there's another success story about moving out! yey!